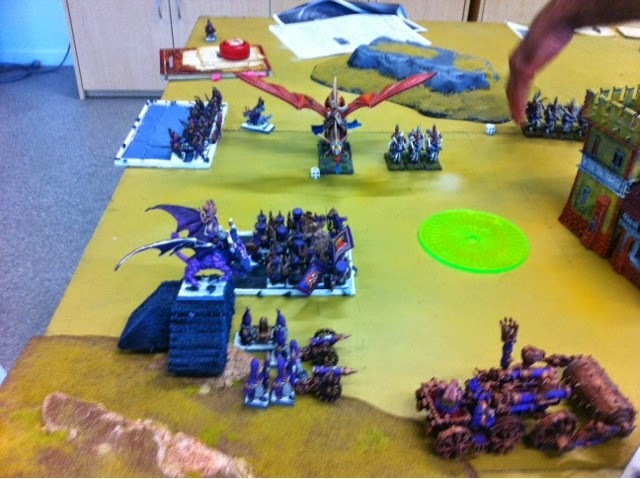 Karl ran Prince Imrik, a level 2 wizard in a white lion bunker with banner of the world dragon, 10 odd silver helms and three units of reavers. My plan was to draw out his Knights for the hell bound iron daemon to charge whilst avoiding the White lions. Those pesky fast moving elves prevented this and actually ended up rear charging the ID. Anyway we played a game of cat and mouse with the high elves winning with Imrik charged the destroyer. Thanks to my casting of a fulcrum and Karl's wizard being sucked down into the warp in turn 1 I had magical dominance and cast enough buffs and debuffs to keep the destroyer alive from the nasty charge of Imrik. His armour and my flaming attacks meant this was a major grind fest. 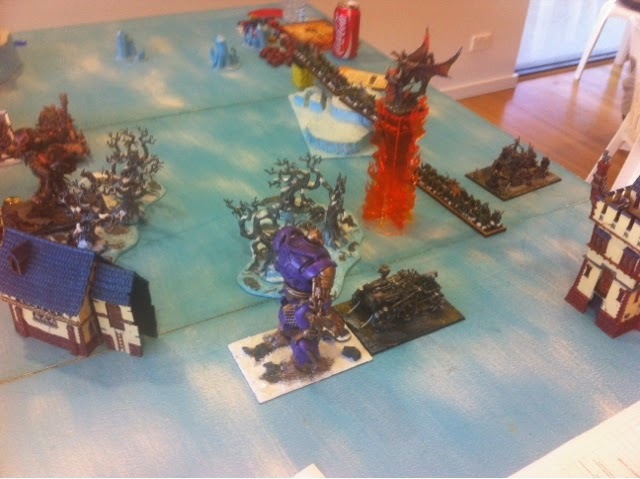 A future flank charge on Imrik by the iron daemon as prevented by the aforementioned rear charge by the silver helms. The destroyer eventually fell to Imrik. 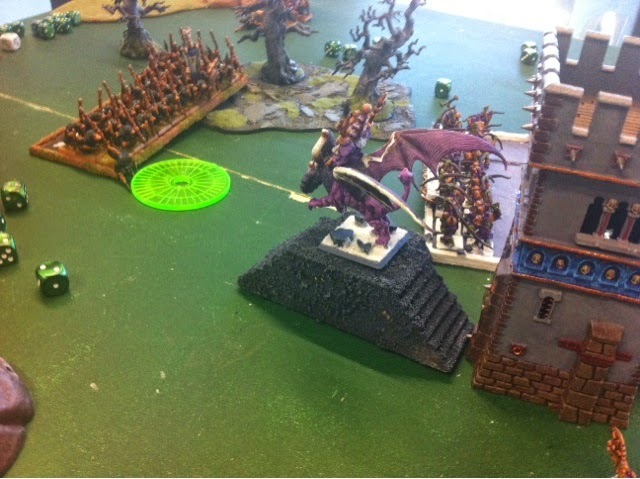 The sorcerer left the safety of his summoned arcane fulcrum and ended up charging into a unit of reavers that had charged one of the death rockets. End result 11-9 to me thanks mainly to the high elf wizard getting u key down the hole. 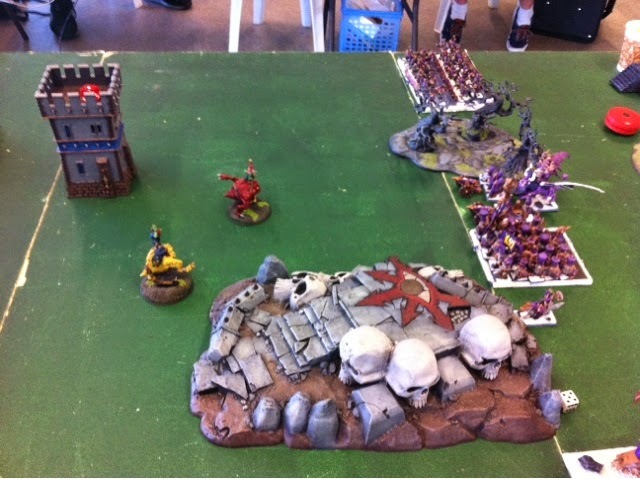 Lesson learnt from game 1- learn how to use my khan to redirect and get that iron daemon charging. End times magic takes too long as I had too many choices with two full spell decks and one end times spell. 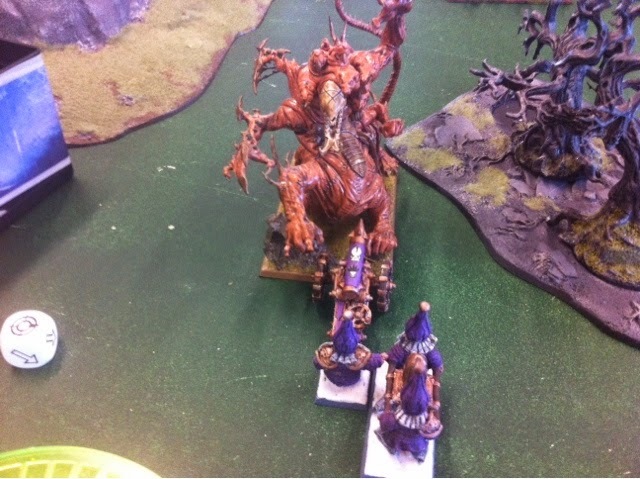 The host of the eternity king elves are a nightmare when in combat. This was a great game with dan running three big units of goblins, six wolf chariots, two manglers, two bolt throwers, stone chucka and two doom divers. There were a heap of characters inc a level 4 and I think a level 2. The manglers surged forward with the chariots coming down the flanks. 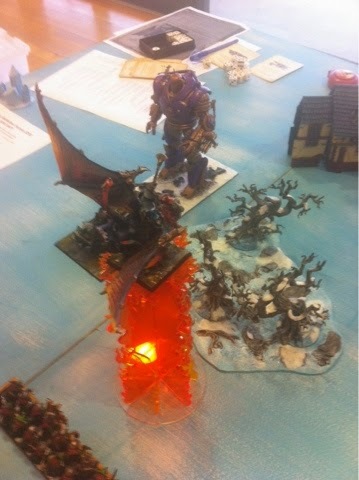 Magic and death rockets took care of those damn manglers as the destroyer and and iron daemon surged forward. 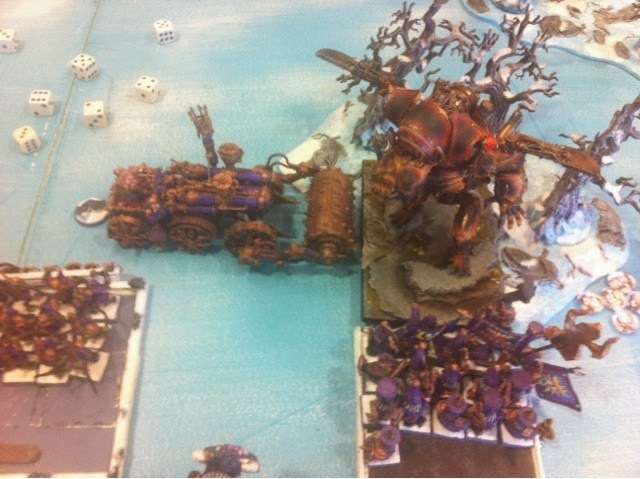 The destroyer was charged by some chariots and the war machines unloaded on the sorcerer lord on another fulcrum and then switched to taking out the the death rockets. 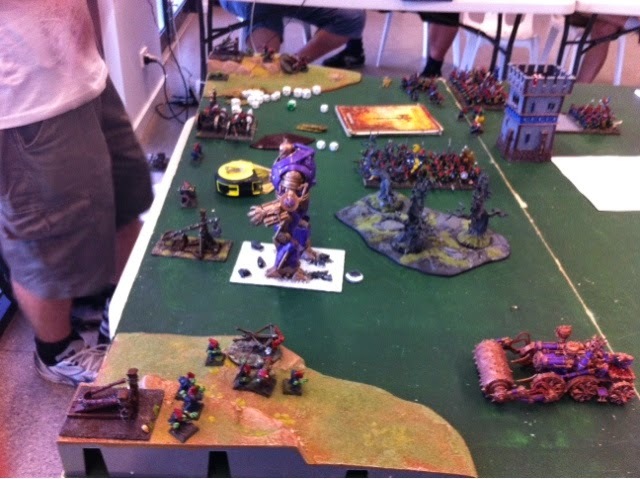 The chariots ended up fleeing from the destroyer who slowly staggered towards the war machine corner on the left flank. He finished the game crushing the stone thrower whilst on his last wound. 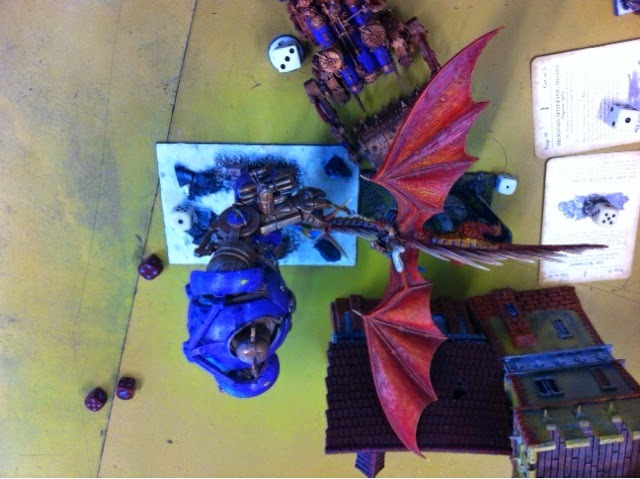 One unit of hobgoblins, the khan and the death rockets all died to a combination of magic and shooting. The end times magic buffed the goblin lord's unit up to poison on a 5+ so I ensured I kept the destroyer a healthy distance away from them. Daniel was a great opponent even when the extra cups of coffee I had, thanks Gavin, meant the numbers on the dice was beginning to get a little blurry lol. 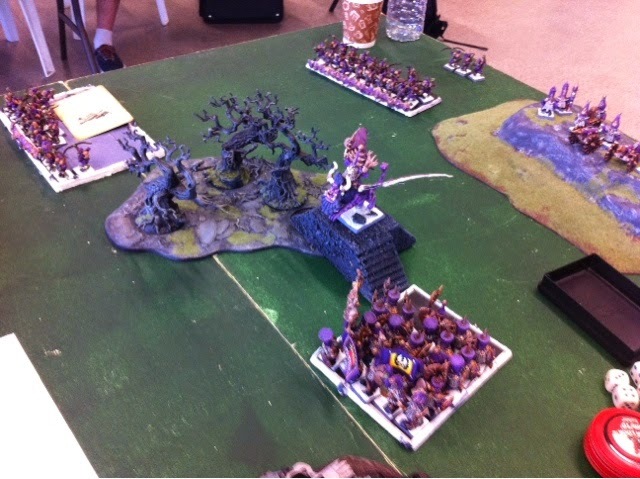 Lessons learnt from game 2- end times magic leads to multiple buffs that can even make a goblin unit pretty scary. It was time for a civil war on the ice table so I had the visual advantage. Anyway Will was a great opponent and I am not too proud to admit I based my army list on one of his with the 2 units of 20 hobgoblins and sorcerer on the lammasu. 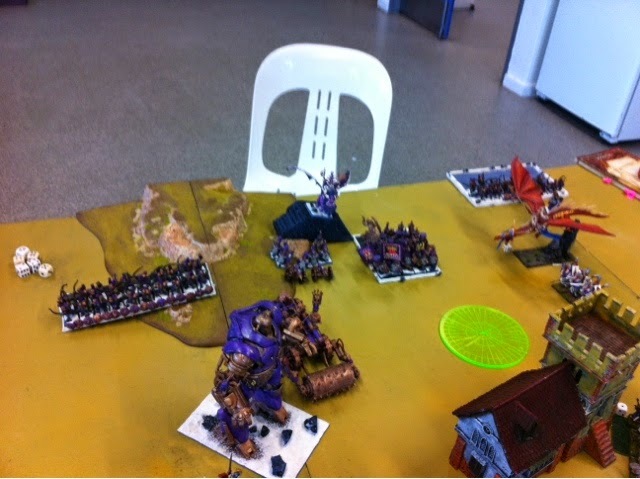 Will's list was sorcerer on lammasu, three units of hobgoblin archers, kdaai destroyer, iron daemon, 20 warriors, hellcannon and some fireglaives. The dawn attack random deployment was pretty good for me with lots of sixes rolled and the subsequent heavy centre of my warriors, death rockets, lammasu and iron daemon. Will was good enough to let me deploy my khan after we both had finished as I left him on the previous table - I blame the coffee. 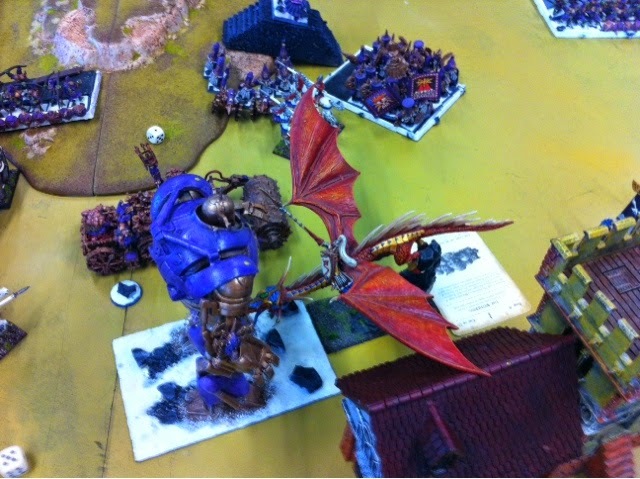 Will's deployment was also centre heavy but my destroyer was facing off against his iron daemon on my right. It was not long for us both to have summoned a fulcrum (again another stolen tactic from Will) and had our respective destroyers heading off in search of blood. Mine failed his first charge but Will's charged my redirecting khan on wolf which I hoped would bring him into a forest. 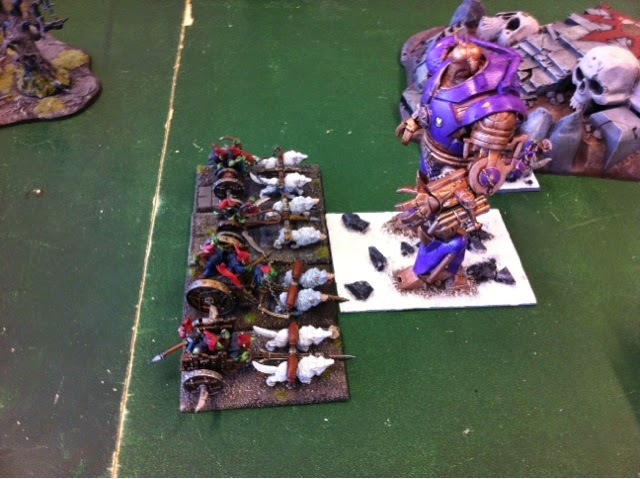 Will implemented his charge well and overran into my unit of warriors. I had positioned my iron daemon for a counter charge and then unleashed end times magic spam to reduce his destroyers strength, toughness or anything else to make him vulnerable. Before the iron daemon hit the unstable rule had meant the magic reduced destroyer would lose combat and take a couple of wounds, the subsequent skull cracker charge was brutal and Will's destroyer was dead. On the right flank it took about three turns of combat for my destroyer to take out Will's iron daemon. 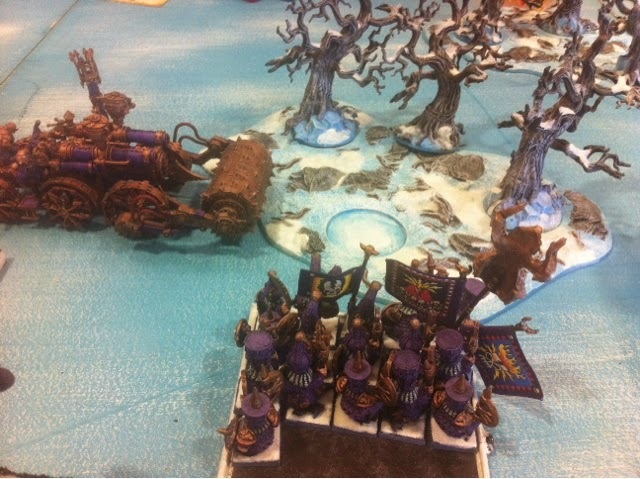 Lessons learnt - mounted sorcerer prophets do do allow rerolls of war machine artillery or scatter dice- I overlooked this when making my list so was a good reminder to read and reread your rules when taking something new. 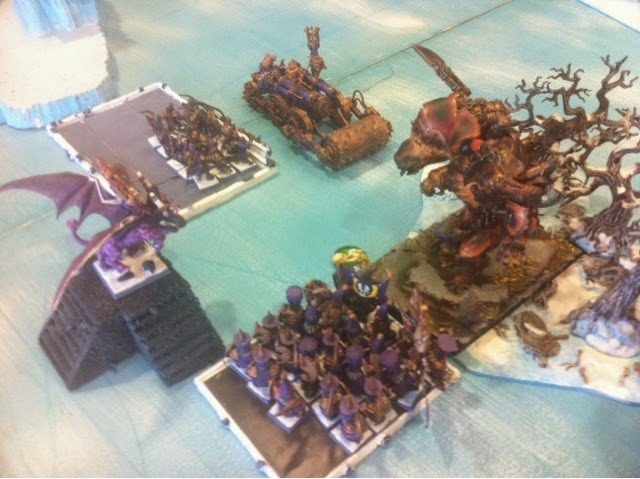 Casey army was big blocks of slaves, a storm vermin block, plague priest block, A bomb, 2 skaven cannons, 2 grey seers and a heap or warlock engineers. This was a quick match - not in my favour. Casey is one of the best players in WA and knows her army well. I surged forward with the khan, iron daemon, destroyer and lammasu. This did not go well for the iron daemon and the lammasu both falling to a cracks call and the destroyer being withered to death. The last glorious shot of my army before the concession speech was made to a hand full of remaining hobgoblins. The remaining infernal guard unit was zapped to death whilst I had not killed any full units of the skaven. It was pretty much over at this point so I threw in the towel and congratulated Casey on a well played massacre of my dawi zharr. Lessons learnt skaven Magic has always hammered me in games and the end times makes it more unrelenting than ever. Overall I had two wins, a draw and a massacre against. Not bad for a silent army in the end times. 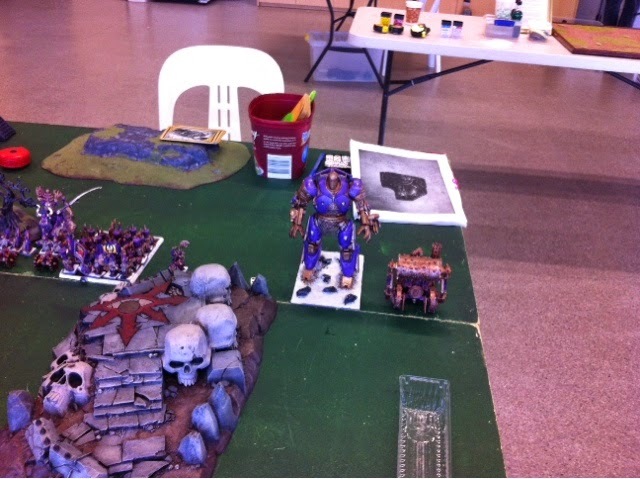 Learning to use the khan as a redirector in combination with the iron daemon was my personal goal for the tournament. I think I did well in my third game when this was part of my plan but failed in my first game. I think the fulcrum saved my lammasu more than once when I was rolling for miscasts as I found I cast more shadow spells using his level 1 lammasu thanks to the end times spam effects. I enjoyed using fire but I think Hashut would have been better but hey this was an end times tournament and GW must have forgotten to make an end times Hashut spell. I ended up seventh of the fourteen punters who came along. I enjoyed every game and my opponents and everyone else I spoke to was a pleasure to spend a Sunday with even though the kiwis lost the cricket which was on the screen during the tournament. 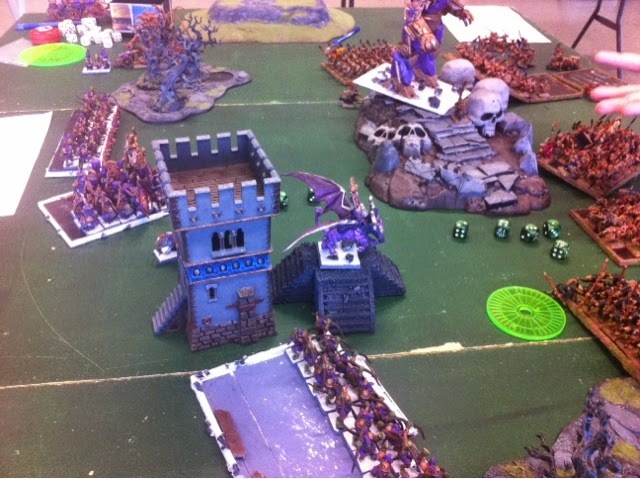 I still think end times rules are incompatible with tournaments without any form of comp but the punters who came along meant I enjoyed this tournament much better than my first end times tournament.